Minimum Qualification : 10th pass OR ITI OR Higher education. Selection Method : Based on assessment of sports achievements, trials & general personality/ intelligence. Applicants should deposit the fee of Rs. 100/- through the Indian Postal Order (IPO). EBC, women, ST/SC/ Christens/ Buddhists/ Muslims/ Sikhs/ Zoroastrians applicants are exempted from the fee. Desirous applicants should apply through the prescribed format. Attach attested xerox copies of age proof, qualification, caste, sports achievement certificates, 1 PP size photograph along with the application. The incorrect application form will be rejected. The receiving of the application after the due date will not be entertained. The railway administration reserves the right to cancel any application & their decisions will be final. 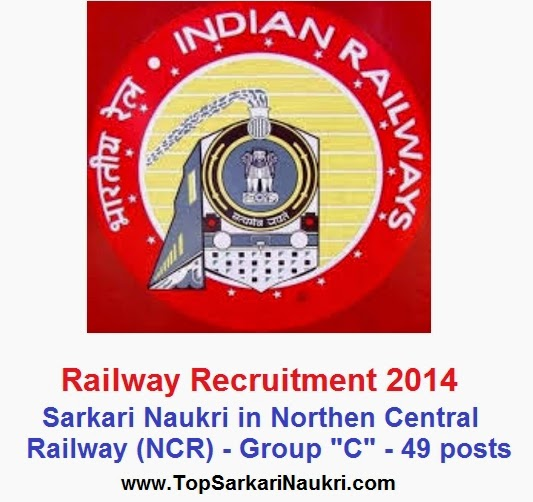 NCR Head Quarters Chairman, Railway Recruitment Cell, North Central Railway, Nawab Yusuf Road, Valmiki Chauraha, Distt- Allahabad Uttar Pradesh- 211001 Chairman, Railway Recruitment Cell, North Central Railway, Allahabad, payable at Allahabad. Allahabad Division Sr. Divisional Personnel Officer, Allahabad Division, North Central Railway, Nawab Yusuf Road, DRM Office Allahabad, Distt- Allahabad Uttar Pradesh- 211001 Sr. Divisional Finance Manager, North Central Railway, Allahabad, payable at Allahabad. Jhansi Division Sr. Divisional Personnel Officer, Jhansi Division, North Central Railway, DRM Office Jhansi, Distt- Jhansi, Uttar Pradesh- 284128 Sr. Divisional Finance Manager, North Central Railway, Jhansi, payable at Jhansi. Agra Division Sr. Divisional Personnel Officer, Agra Division, North Central Railway, DRM Office Agra, Distt- Agra, Uttar Pradesh- 282001 Sr. Divisional Finance Manager, North Central Railway, Agra, payable at Agra. Jhansi-West Sr. Personnel Officer, Jhansi Workshop, North Central Railway, CWM Office Jhansi, Distt- Jhansi, Uttar Pradesh- 284003 Workshop Accounts Officer, North Central Railway, Jhansi, payable at Jhansi.